SEOUL, South Korea -- A North Korean missile exploded during launch Sunday from the country's east coast, U.S. and South Korean officials said, a high-profile failure that comes as a powerful U.S. aircraft carrier approaches the Korean Peninsula in a show of force. 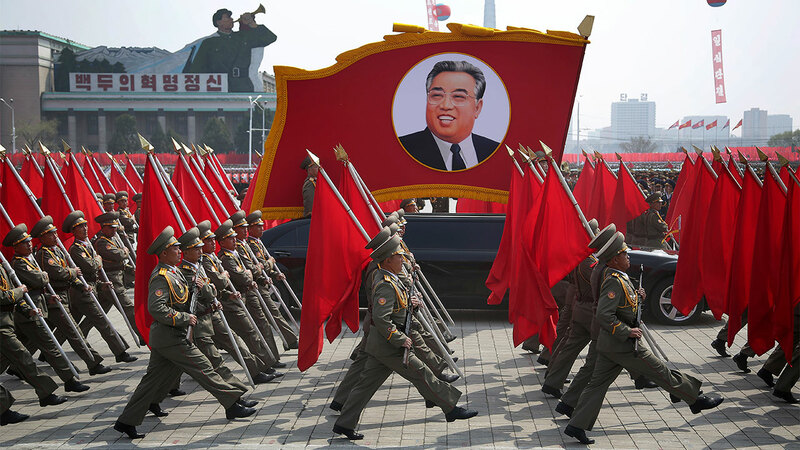 It wasn't immediately clear what kind of missile was fired from the city of Sinpo, but the failure will sting in Pyongyang because it comes a day after one of the biggest North Korean propaganda events of the year- celebrations of the 105th birthday of late North Korea founder Kim Il Sung, the current leader's grandfather. The ultimate goal is to have a full array of nuclear-tipped missiles in response to what Pyongyang says is hostility by Washington and Seoul meant to topple its government. North Korea is thought to have a small arsenal of atomic bombs and an impressive array of short- and medium-range missiles. Many outside analysts believe that North Korea has not yet mastered the technology to build warheads small enough to place on long-range missiles, though some civilian experts say North Korea can already build nuclear-tipped shorter range missiles that have South Korea and Japan within its striking range. Chronically high animosity has risen on the Korean Peninsula in recent months, as the United States and South Korea conduct annual war games that North Korea claims are invasion preparation and the North prepared for Saturday's anniversary celebrations. A U.S. aircraft carrier, the USS Carl Vinson, is heading to waters off Korea in a show of force. Analysts warn that even failed missile launches provide valuable knowledge into North Korea as it tries to build its weapons program. The country launched a long-range rocket and conducted two nuclear tests last year, including its most powerful to date. Another missile test from Sinpo failed earlier this month, when the rocket spun out of control and plunged into the ocean. That launch came shortly before U.S. President Donald Trump's first meeting with Chinese leader Xi Jinping. China is North Korea's only major ally. The extended-range Scud missile in that earlier launch suffered an in-flight failure and fell into the sea off North Korea's east coast, according to U.S. imagery and assessments.